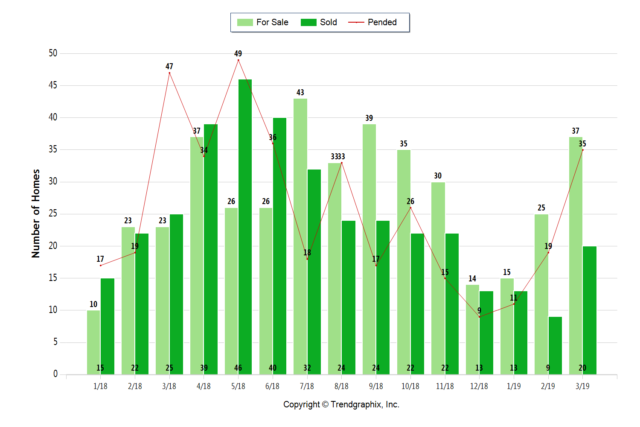 March 2019 Almaden Valley Real Estate Market Update… The Almaden Valley real estate market ended the month of March showing solid signs of recovery from the holiday doldrums. 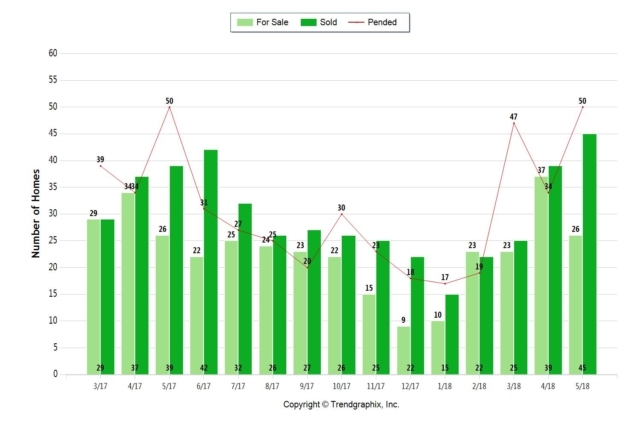 The number of single family homes under contract jumped from 19 in February to 35 in March, and the number of sales rocketed from 9 to 20 in the same time frame, while the number of single family homes on the market increased from 25 to 37. The average price per square foot inched up from $673 in February to $678 in March. 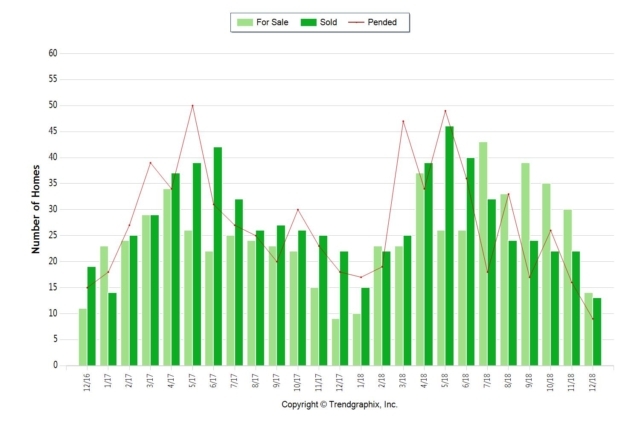 When we compare the Almaden Valley market performance to years past, we can see that the wild ride with sellers at the wheel has slowed down considerably, and the market continues showing signs that it is turning to a normal market. We are not seeing quite as many single family homes selling for more than the list price, indicating that inventory is more than meeting demand. The number of homes sold each month has been trending slightly downward, a sign that demand has cooled a bit from the past frantic activity we saw. Make no mistake, demand for homes in Almaden Valley is healthy, but the market shift means it’s not quite as easy to sell as it was in times past, when almost all it took was putting a “For Sale” sign in the yard. The spirited bidding wars are not nearly as common as they were, either. But homes that are move-in ready and priced well still receive a lot of attention. And now that all our rain has appeared to have stopped, it is quite possible that buyers will soon be out again in droves. If you are thinking of selling your home, contact me and let me show how I can help you make the most of our changing market! January 2019 Almaden Valley Real Estate Market Update… Almaden Valley single family home sales are coming out of the sleepy holiday season as January statistics show. The number of homes on the market increased slightly from 14 in December to 15 in January, but the number of homes under contract jumped over 33%, from 9 to 12 over the same time period. When comparing longer-range trends, it would appear that the red-hot nature of the real estate market has cooled a bit compared to our dramatic performance in 2018. Despite more homes offered for sale, the number of homes under contract in January of this year dropped almost 30% from the same time last year (17 versus 12) and the number of solds over 13% (15 versus 13). It appears that the Almaden Valley single home market is transitioning from being controlled by sellers to a more balanced market. The drop in price per square footage that we saw in January (down from $681 in December to $642 and down from $672 in January 2018) bears this out. Homes are remaining on the market for longer as well. We saw a rather dramatic jump in days on market in December (31 days) to January (51 days). Contrasting last month to the same time in 2018, we see an even more dramatic jump from 20 days. What does this mean for home sellers in Almaden Valley? Selling a home may take longer and prices are quite possibly not going to go as high as last year’s record high ($757/sq ft in June 2018), so try to catch the spring market if at all possible. There was a lot of rain in February, but as soon as the sun comes out, I am sure we will see dramatic improvement. If you have any questions or are ready to make a move, give me a call! December 2018 Almaden Valley Real Estate Market Update… The Almaden Valley real estate market ended 2018 on a quiet note. 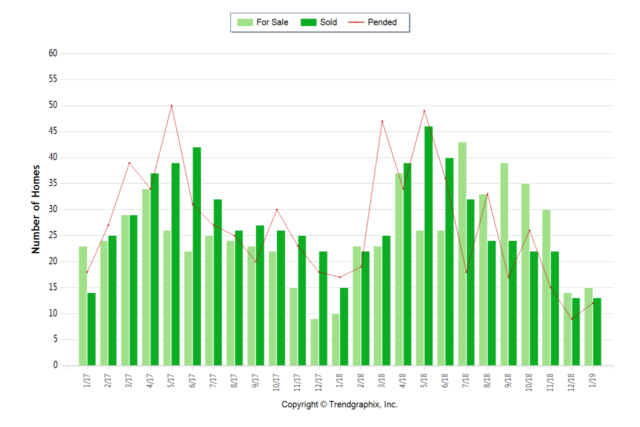 Active, pending and sold listings all ended lower than they were in November, which is a pretty typical holiday season feature. The average price per square foot was up over 5% from November, ending the year at $681. When compared to previous years, we saw some elements of the white-hot Almaden Valley single family home market cool down a bit the last few months of 2018. Months of Inventory available in December 2018 was significantly higher than it has been in recent years, due to an increase in sellers entering the market. When comparing 2018 to years past, we can see that overall inventory often met or exceeded demand, which is a hallmark of a transition to a market where buyers exert more market influence, and sellers compete for buyers rather than vice versa as we’ve seen in the past. The gradual increase in average price per square foot seems to bear out the gradual cooling, especially when comparing prices from previous Decembers. In December 2017 we were at $671/sqft level. This increased to $681/sqft in December 2018, a rather modest 1.5% increase as compared to the much higher 9.3% increase we saw from December 2016’s $614/sqft level to December 2017. But, don’t worry, things appear to be picking up these past couple of weeks as we head into the spring selling season. If you’re thinking about getting into the market, send me an email or give me a call! The November 2018 Almaden Valley real estate market report reflects that the market is winding down for the year as both buyer and seller interest wane with the approaching holidays. We’ve seen a few patterns in 2018 that give some indication that our real estate market is transitioning from one controlled by sellers to one that favors buyers, but we’ll wait until the end of the year to go into depth. October 2018 Almaden Valley Real Estate Market Update… Almaden Valley real estate is firmly in the grips of the seasonal slowdown. The number of single family homes on the market in October was down to 35 from 39 in September and the number that sold dropped to 22 from 24 over the same time period, indicating that both buyers and sellers are showing less interest as we approach the holiday season. The average price per square foot drop to $659 from $723 the previous month bears out this observation. When comparing this past month to the same time last year, we see a bit less activity. The number of single family homes on the market is up over 59% from October 2017. 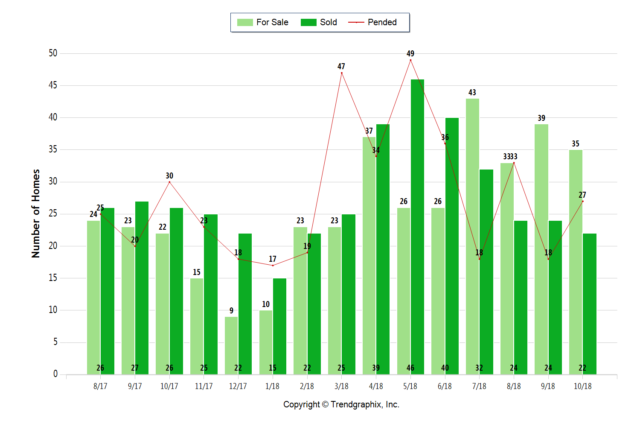 I’ve been mentioning in other market reports that sellers have been more active this year, and this number demonstrates that. Sales, however, have cooled slightly: 26 single family homes sold in 2017 versus 22 last month. However, the average price per square foot was $619 in October 2017 versus $659 this past month, which may explain why sales were a bit more brisk in comparison. Overall, the holiday season tends to be a good time for buyers as inventory is good and competition is not nearly as keen as it is other times of the year. If you are thinking about buying a home, drop an email, text or call and let me show you how YOU can take advantage of the holiday market! September 2018 Almaden Valley Real Estate Market Update… September wrapped up on a quiet note in preparation for the upcoming holiday season. The number of single family homes on the market jumped from 33 in August to 39 in September, while the number of homes under contract dropped from 33 to 19 and the number sold remained 24 over the same time period. The drop in pending sales is very likely due to a buying frenzy that happened in August, perhaps buyers trying to beat the next interest rate hike. 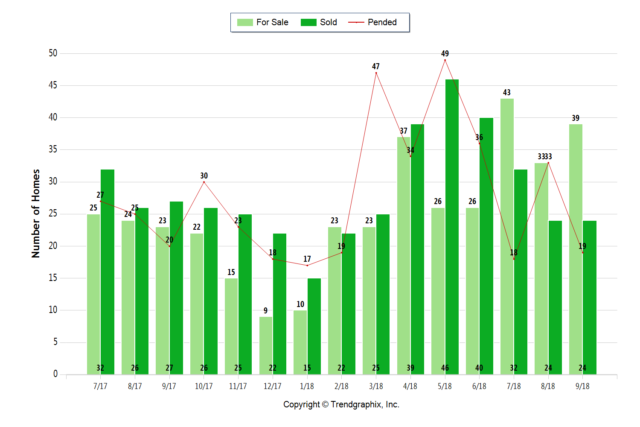 The average sold price per square foot edged up from $697 in August to $723 in September, indicating that buyers are still keen on Almaden Valley real estate and sellers are responding to the near-record average sale price per sqft by offering their homes to the market. Observing the trends over the last year and more, it appears that our real estate market is luring home owners to sell and inventory is gradually increasing above the critical levels we’ve gotten used to. Generally speaking, as inventory increases in a seller’s market such as we’ve been experiencing, the balance reaches a point of equilibrium between the number of buyers and the number of homes on the market. Overall, though, we are seeing the seasonal transition to a quieter real estate market. If you’d like more information about current market trends or are thinking about buying or selling a home in the Almaden Valley, call, text or send me an email and I’ll be glad to help you out! August 2018 Almaden Valley Real Estate Market Update… August was a busy month for buyers of single family homes in Almaden Valley. The number of homes under contract shot up a dramatic 89% from July, while the number of homes on the market dropped 25% during the same timeframe. We saw one of the highest numbers of homes on the market in July, and buyers responded enthusiastically. We DID see the average price per square foot retract somewhat from July to August, from $713 to $697, but this could easily be a function of the fact that so much inventory came on the market at one time that buyers had more control than we’ve seen. Traditionally, September is usually the starting month for the holiday cooling trend. After the excitement of the July/August bulge, it will be interesting to see what autumn brings. 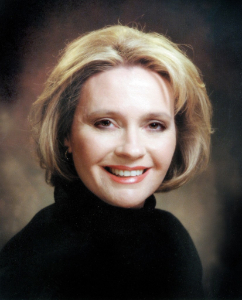 If you have any questions about recent market trends or would like to get into the market, give me a call! 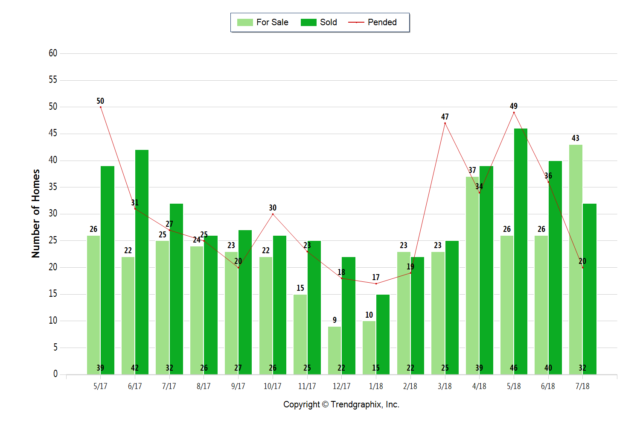 July 2018 Almaden Valley Real Estate Market Update… The Almaden Valley real estate market is entering the end of summer cooling phase. July saw a dramatic jump in the number of single family homes offered on the market; up to 43 from 26 in May and June. We haven’t seen this amount of inventory since late summer/fall 2016. The numbers of homes under contract and sold have dropped from June, which is not unusual for the summer months. The average price per square foot dropped to $713 from $757 in June, which is also not unexpected given the time of year. Evaluating sales data during this pivotal time of year can be difficult. The market will likely pick up the pace again after buyers return from their summer vacations. But the rapid increase in homes on the market could be an early sign that the market will shift slightly in favor of buyers. If you’d like more information about current market trends or are thinking about buying or selling a home in the Almaden Valley, give me a call! 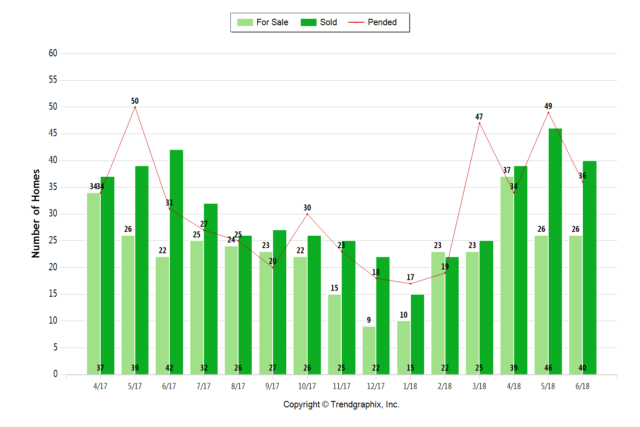 June 2018 Almaden Valley Real Estate Market Update… Although June’s listing, pending and sold data for single family home sales in Almaden Valley is for the most part the “same old, same old” story of short supply and hot demand, we DID reach a milestone for the average price per square foot of $757. According to MLS data, this is the highest it has been in over ten years. Although prices have been gradually increasing since 2012, quarterly trends show robust gains since the end of 2017. In evaluating the market over the last year, we saw inventory slightly up from June 2017 but remaining unchanged from May to June 2018. 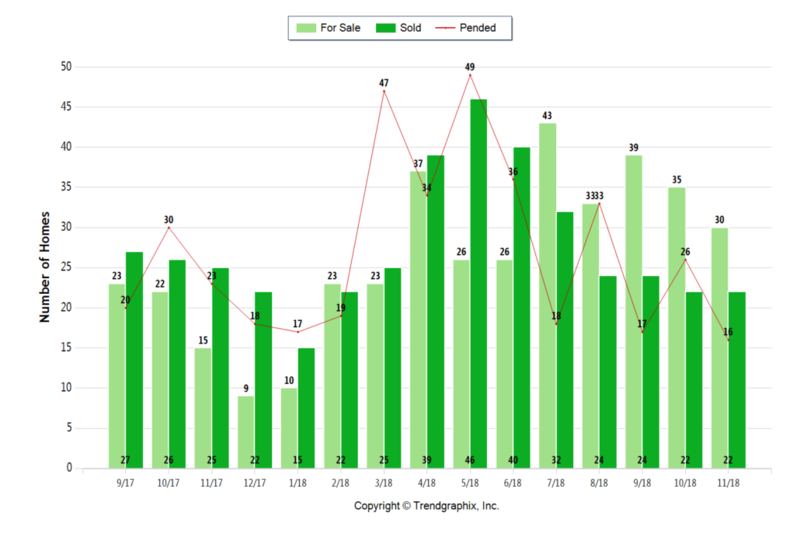 The number of pending and sold single family homes is lower in June compared to May of this year. To see why we saw this drop happen, all we need to do is step back to April when we saw a sudden influx of new single family home listings. 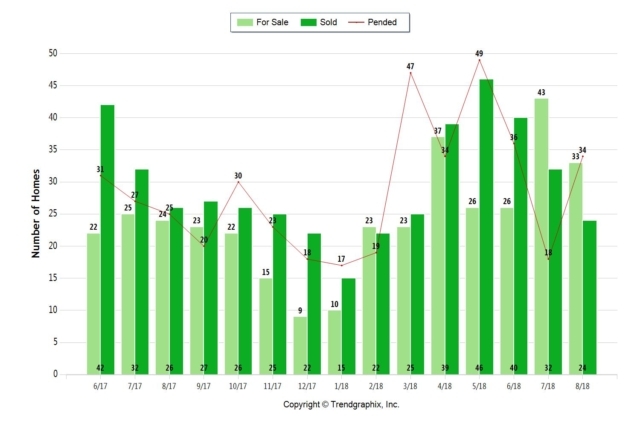 Combined with the increase in price per square foot, it is probably safe to say that buyers responded heartily to the increased inventory from April which drove the pending and sold numbers up in May. Any way one looks at it, we are in a distinctly seller-driven market. Summer is traditionally one of the most active times of the year for Almaden Valley real estate, and we have another month or so before the traditional seasonal slowdown starts. If you are thinking about selling your home, contact me and let me show you how you can make the most out of the summer hot market! May 2018 Almaden Valley Real Estate Market Update… Tight inventory continues to dominate the Almaden Valley single family residential real estate market. The number of sales has been keeping up and often exceeding the number of single family homes on the market for quite a while, creating a shortage of homes. When we compare May 2018 with May 2017, we see that although the number of homes for sale and those under contract are unchanged, the number of sold homes is up over 15%, meaning competition is even keener for available inventory. This shortage is reflected in the average price per square foot, which has reached a high point of $713, up dramatically from the $668 we saw in April. If past trends are any indication, things should start cooling down in the next 30 days or so as we slide into autumn and the seasonal slowing we tend to see this time of year. However, given the tight inventory and robust demand, we’ll just have to see.